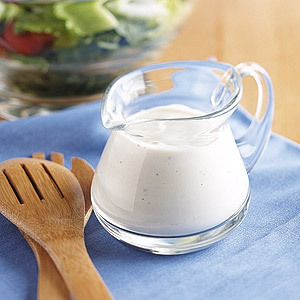 Skip the prepackaged sodium packed dressing—this recipe for creamy Italian dressing tastes better homemade. Serve this lighter version of creamy dressing over any fresh greens. Combine mayonnaise, milk, onion, vinegar, sugar, garlic powder, salt, and black pepper in a blender of mini food processor; blend until smooth. If a thinner consistency is desired, stir in a little more milk as need.